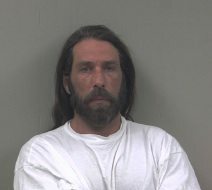 IRON MOUNTAIN — A jury trial has been set for a Loretto man accused of injuring another man with a knife last year. Timothy John LaPine, 46, will have a May 14 supplemental pre-trial conference and a July 30 through Aug. 1 trial, both in Dickinson County Circuit Court. LaPine faces assault with intent to do great bodily harm less than murder or by strangulation, a 10-year felony; unlawful driving away of a motor vehicle, a five-year felony; felon in possession of a firearm, a five-year felony; felony firearm, a two-year felony; and a habitual offender-fourth status, which increases the maximum penalties on the first three charges to life and the fourth charge to 15 years. A 44-year-old Loretto man told police he and LaPine were at another person’s home Nov. 18 and LaPine left before he did. When the man left the house, he discovered his vehicle, which had a hunting rifle on the front passenger seat, was missing, according to the criminal complaint. The man went to LaPine’s residence and found his vehicle behind a wood pile, the complaint stated. The man claimed he was invited into the home and then witnessed LaPine take drugs and become “really strange,” according to the criminal complaint. LaPine reportedly got two knives and held one to the man’s throat while telling a woman in the room, “We are going to kill him and you’re going to help,” the complaint stated. The man told police LaPine stuck a filet knife in his chest and pressed it through multiple layers of clothing until it punctured his skin, leaving a half-inch diameter stab wound, according to the complaint. He sought his own medical attention for the injury, Dickinson County Sheriff’s Office officials said.